During New Year’s in Japan, people eat special food called osechi ryouri (お節料理). Nintendo is ready to 1up that traditional cuisine with Mario and friends. 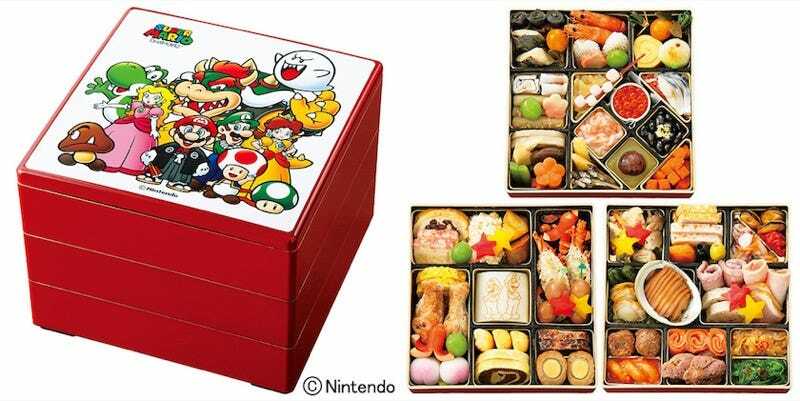 Website Culture Lab reports that for 2016, Japanese department store Takashimaya has Super Mario osechi ryouri, which references the iconic Nintendo games, comes with special Super Mario cards, and might be more kid-friendly that your typical New Year’s food. It’s priced at 27,000 yen (US$225). That’s expensive (Takashimaya is a fancy department store with fancy prices), but remember this special food is supposed to be eaten over the course of several days. You might remember that previously there was Pokémon osechi ryouri. You might not! I don’t know.